Cavalry Sword. A versatile plastic sword with many uses as it works for many different periods. 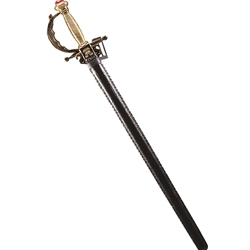 It has a jeweled handle, a black scabbard with belt loop, and a 22-inch blade. Works in many productions. Available in Silver or Gold.